New York Botanical Garden: A Flowering Ode to Emily Dickinson The reclusive poet Emily Dickinson was a devoted gardener and lover of flowers. Now the New York Botanical Garden in the Bronx has re-created Dickinson's gardens, with poems placed between beds of flowers. The flower show Emily Dickinson's Garden: The Poetry of Flowers, at the New York Botanical Garden, re-creates a 19th-century-style New England Garden. Flowers on display include dianthus, bowallia, foxglove and delphinium. Though no paintings or drawings of Emily Dickinson's own garden exist, the New York Botanical Garden drew on descriptions in letters and poems, as well as descriptions from Dickinson's niece, to re-create gardens overflowing with flowers. 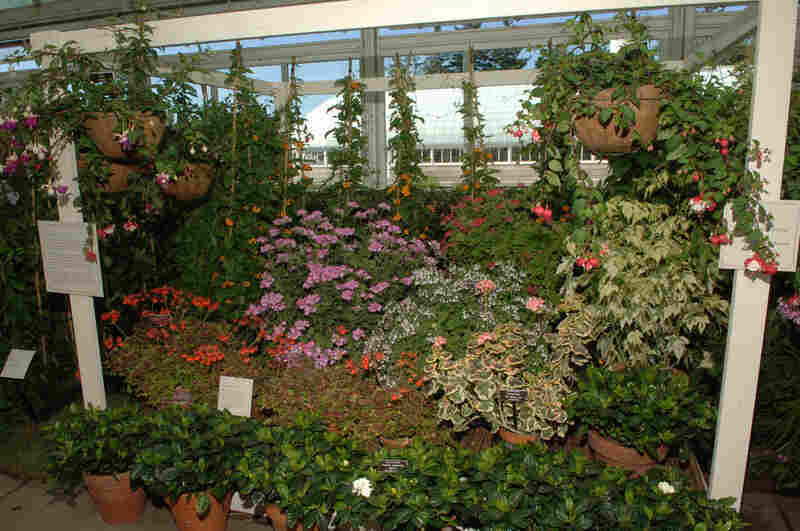 Camelias, fuschias, hyacinths, daffodils, gardenias, crocuses, primroses, heliotropes and dianthus were some of the plants Dickinson grew in her conservatory, which the New York Botanical Garden has re-created. The walls were lined with white shelves and hooks for potted and hanging plants, and in colder months, it was filled with exotic plants. 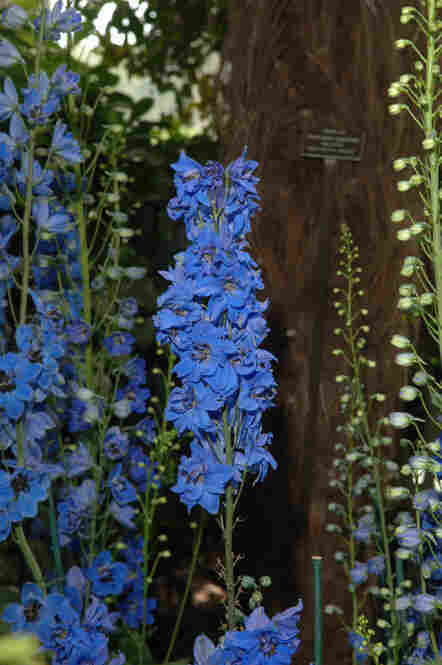 Blue delphiniums on display in the Enid A. Haupt Conservatory at the New York Botanical Garden as part of Emily Dickinson's Garden: The Poetry of Flowers. 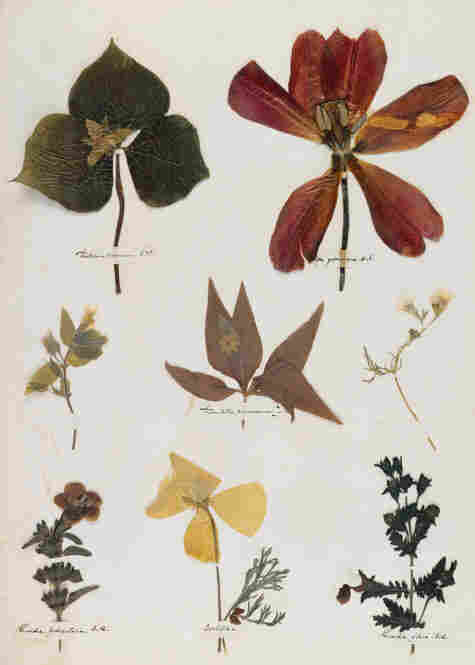 When Dickinson was 14 years old, she created a herbarium, pressing flowers and plants onto many pages of a book. A digital facsimile of the herbarium is on view at Emily Dickinson's Garden: The Poetry of Flowers. Plaques with Dickinson's poetry — including this excerpt from "The Gentian weaves her fringes" — are placed among the flowers in the show. 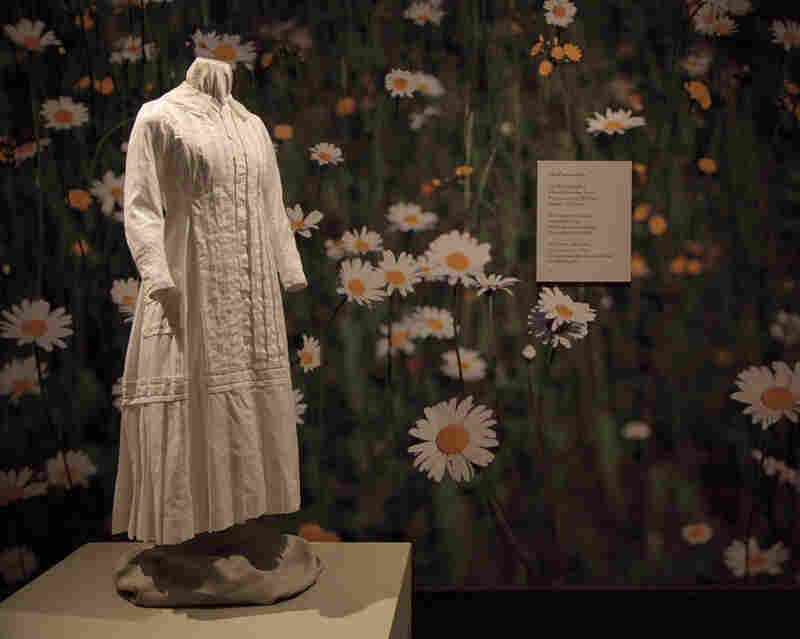 A reproduction of the white cotton dress Emily Dickinson wore while gardening, on display at the New York Botanical Garden. The flower show Emily Dickinson's Garden: The Poetry of Flowers, at the New York Botanical Garden, re-creates a 19th- century-style New England garden. 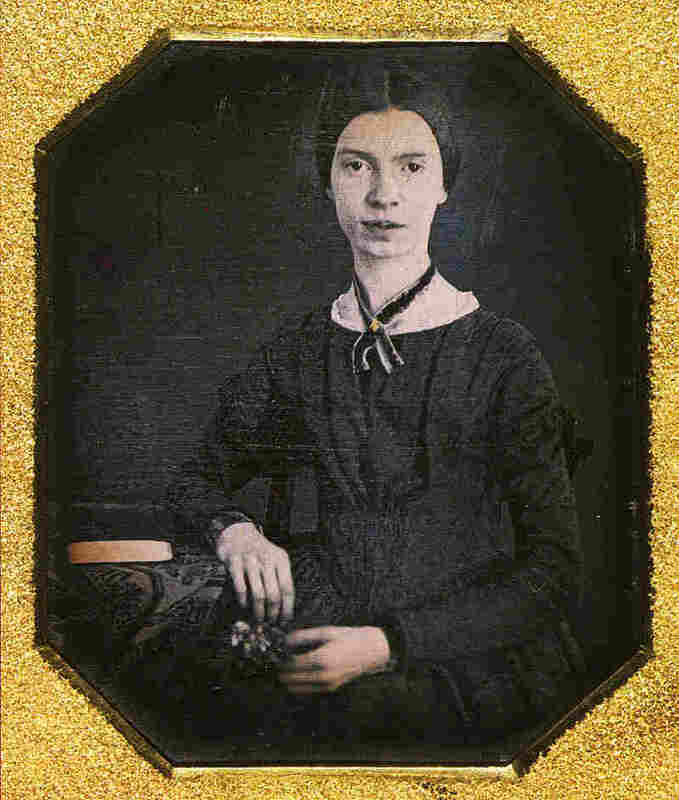 "The people of Amherst who were the friends of Emily Dickinson and her family often received these poems, these short poems with presents of flowers or food," Long says. "They knew her as a poet because of these. Because nothing was really published in her life, or very, very little. So they found the poems, of course, very eccentric." 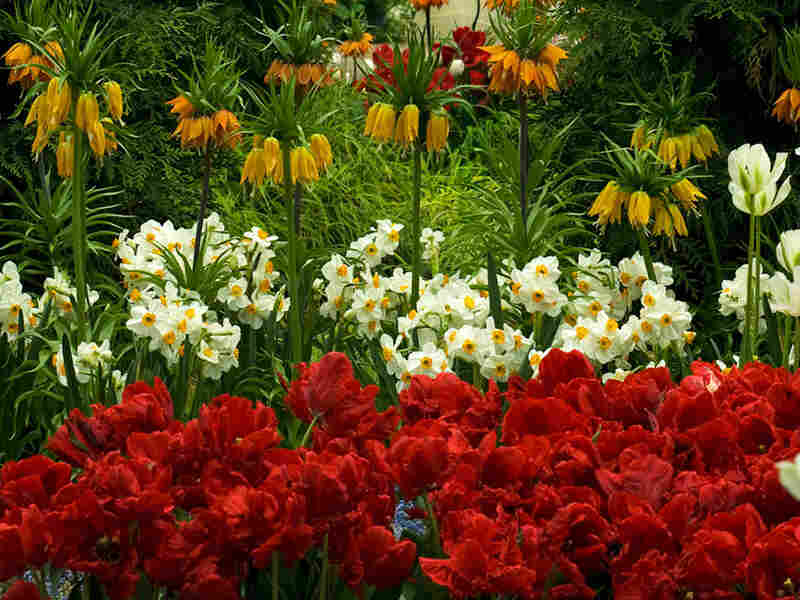 In fact, Dickinson was better known as a gardener than as a poet. "She knew a great deal about plants, and she grew them very well," Long says. "And what we found is that her poems are not sentimental valentines to flowers. They're serious poems, but they're tied to her great passion for plants and nature. So we decided, well, we should introduce people to Emily Dickinson not only as a poet, but as a gardener." 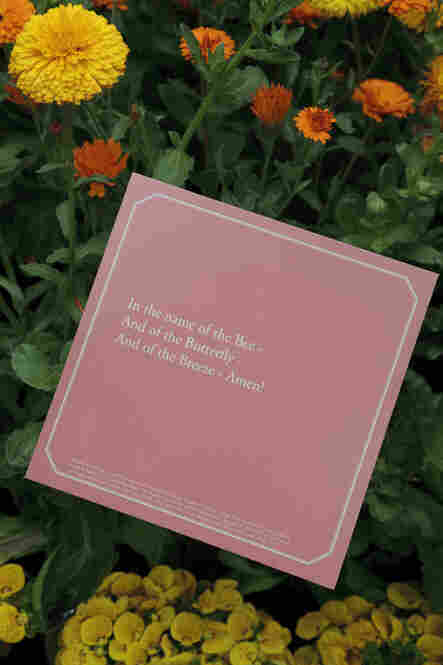 On the path that runs between beds of flowers at the New York Botanical Garden, more than 30 poems are displayed on boards next to plants and trees and flowers that inspired them. The walk begins near a delicate rosebush accompanied by a poem, called "She sped as Petals of a Rose," that Jennifer Rothman, who helped design the poetry walk, says Dickinson wrote in memory of a young child who died. The process of creating the exhibition, Rothman says, began with a survey of poems like that one. "It started by going through all of her poems and finding first the ones that had to do with flowers or plants and narrowing it down to that group," Rothman says. "And so then we chose poems that would reflect the flowers that would be in bloom or the landscape." Nearby, four trees stand in front of a large lawn of grass, accompanied by Dickinson's poem "Four Trees -- upon a solitary Acre." And inside the Botanical Garden's glass-domed conservatory is a re-creation of Dickinson's own garden. 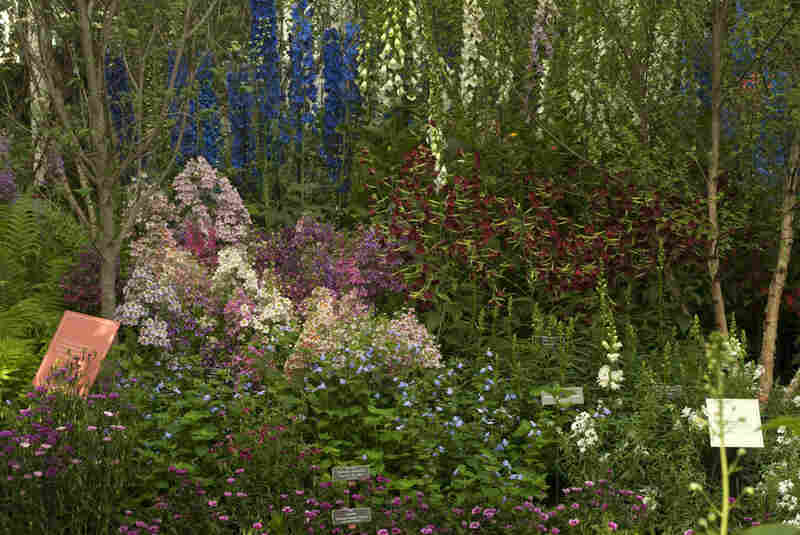 Todd Forrest, who designed the garden, says it is filled with the types of flowers Dickinson might have planted around her family's home. Foxgloves, daffodils, zinnias and hydrangeas all bloom at the same time in this hothouse atmosphere and overflow the garden beds. There is even a small orchard nearby, blanketed in flowers that might have grown naturally near Dickinson's home. In something of a shock, Forrest made sure the mix of flowers included dandelions, a move that he says raised an eyebrow or two around the Botanical Garden. Long adds that they have to keep the staff gardeners from uprooting the tiny yellow flowering weeds. "I know for a fact that this is the first time we've grown dandelions for a flower show," Forrest says. "But dandelions were very important to her. In fact, she referred to herself more as a dandelion. She felt more comfortable and more natural in the fields with the dandelions than she would in the drawing rooms with the fancy folks around Amherst." Dickinson loved getting her hands dirty. "She tramped through the woods her entire life," Forrest says. "I have no doubt that she was out there deadheading, dividing. Any gardener is only happy when you're out in the garden pulling a weed or two, including dandelions." Within the Botanical Garden's re-creation of Dickinson's garden, a path leads to a facade that represents her family's home. Just inside, there's a small replica of her bedroom. "She wrote most of her poetry sitting at a small desk," Forrest says. "She would go out to visit her brother and sister-in-law next door, come back, and then light a lamp in the window to let them know she had returned. And we have found our visitors like to stop and look out the window. 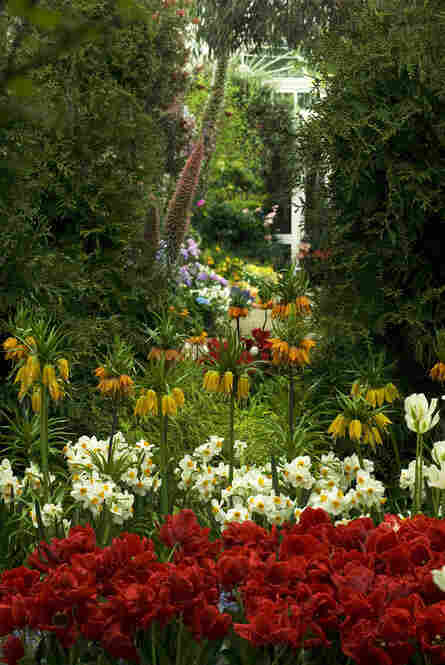 And it makes them slow down and look at the garden very much as Emily might have." Dickinson rarely left the estate -- she did not even attend her father's funeral in 1874. The garden, and the path between the two houses -- in Dickinson's words, "just wide enough for two who love," according to Rothman -- was her entire world. "She used to bring her niece Maddy to her room and she would close the door and lock it, and say, 'This is freedom,' " Rothman says. "And so she really felt that when she was in her room and she was looking out along the wooded path between her family homes, that she was free." The exhibition concludes in the Botanical Garden's library, where objects from Dickinson's life are on display -- including the white cotton dress she wore even while gardening. She always kept a poem she was working on in the pocket of the dress.